I couldn't find white pumpkins anywhere so I just tried to find some of a small-medium size. I wanted something a bit different and not just orange (although I'll be using that later and featuring all my pumpkins together at the end of the week) so I bought a buttercup squash from the grocery store. I made circles for the eyes and just kept carving them until they were big enough that the eye wedged in the hole. These will need to be 'cone' shaped (so angled). I found the buttercup squash to have an extra difficult to cut rind. It also turned my fingers temporarily green! Then, with the label that I printed from the zombie page (linked above), I used a thumb tack to draw an outline of the mouth which made it a lot easier to carve. Then you just shove the eyeballs in at different angles and you have your zombie! I think mine looks more silly than zombie-ish but it's still so cute! I smile every time I see it! In retrospect, I think when I make another one this week, I'll space the eyes further apart to see if that helps. 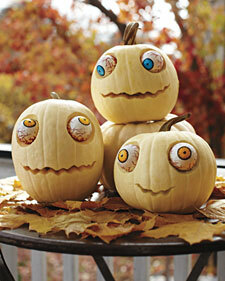 Stay tuned all week for more pumpkins - including vampire and mummy all courtesy of Martha Stewart Living! Scary, kooky, or silly, either way he's unique and cute!